Think of Iceland and no doubt belching volcanoes, a broken economy, barren land, expensive airfares or the high cost of living might come to mind. 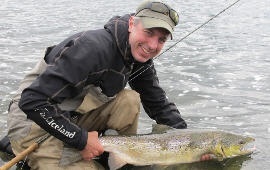 Don’t worry, you are not alone as these misconceptions are frequently expressed to Jon Sigurdsson, former captain of the Icelandic national basketball team and director of FishIceland, in his quest to promote angling to a worldwide audience*. However, Iceland and it’s boiling mud pools, spurting geysers, glaciers and waterfalls is in fact a vast adventure playground. It is the least densely populated country in Europe, with a pure, unpolluted and truly magical landscape which inspires artists, musicians and photographers alike. Icelandic summers are surprisingly warm, lush and green, with days lengthening until midsummer, when the sun dips down to the horizon but never sets. It’s no coincidence that this is also when Iceland’s renowned salmon and trout fishing really begins to kick off – serious fishing for serious anglers, to suit every pocket. 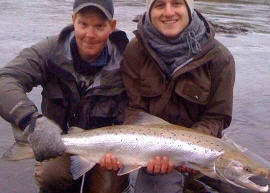 The main season for salmon fishing is from mid-June to mid-September. For those readers perhaps contemplating a summer break in an angling paradise, three day’s salmon fishing on the Sog river with accommodation and a private guide included on your first day, will cost £999 (€1190) per person. Trout fishing varies from one river or lake to the next, but the normal season is from April/May until late September/October. 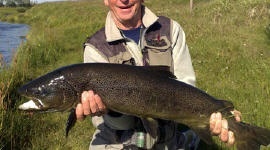 FishIceland can arrange trout fishing on the famous northern river Laxa with self catering accommodation included where you can stay as long as you want to. The island is now served by at least 14 airlines with regular flights served by three of these to the UK. Return flights cost as little as £60 return on the new service being launched by EasyJet from Luton later this year. Regardless of when you visit, you can be assured of the warmth of the Icelanders’ welcome and their desire to share their culture and make every effort to ensur that your stay is a pleasant one. They will help dispel the many myths about this fascinating island perhaps with just one exception – the ‘hidden folk’. 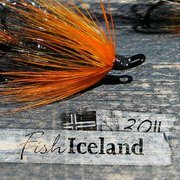 All this and much more can be found on FishIceland.com or email jon@fishiceland.com with your ideas and he will help compile an itinerary for you.